PUEBLO GRANDE MUSEUM BLOG: Joining Forces for National Archaeology Day! Joining Forces for National Archaeology Day! Mudslinging activities were a great success at PGM last Saturday! 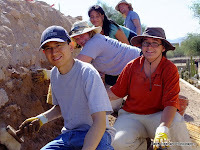 October 22, marked the first National Archaeology Day, an annual celebration of archaeology and the thrill of discovery, established by the Archaeology Institute of America (AIA). 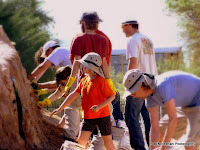 The Central Arizona Society of AIA came to PGM to help with the monthly maintenance of the Pueblo Grande platform mound. Routine stabilization maintenance activities are performed by the PGM Mudslingers one Saturday per month from September through May. 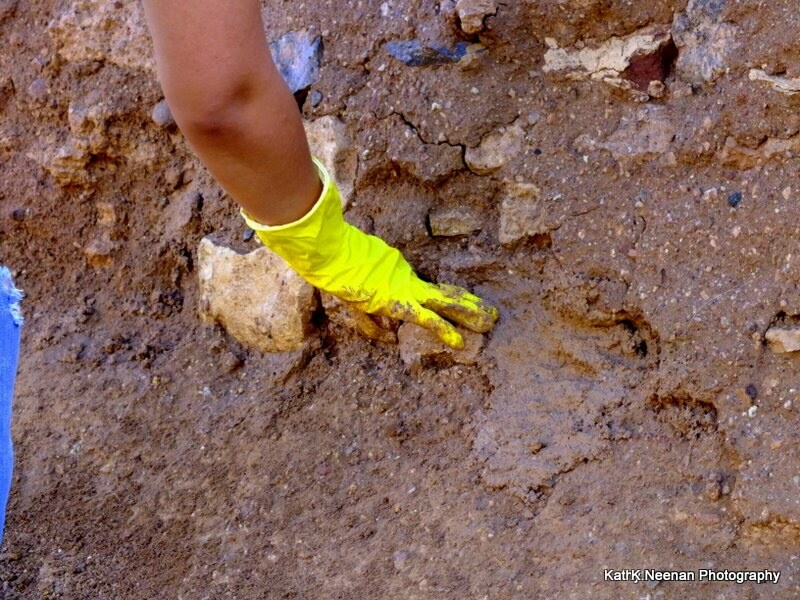 The Mudslingers, a volunteer group, was originally created by the Southwestern Archaeological Team (SWAT). Jim Britton, group leader, eventually developed the group into a separate entity, naming it the “PGM Mudslingers.” It now consists of volunteers from various organizations as well as members of the public. Jim has been instrumental in maintaining the Pueblo Grande ruins for the past 18 years. Thirty volunteers, including 15 from AIA, showed up for work on Saturday. AIA members were divided into two groups, and while one group was slinging mud, the other group received a tour of the museum and the archaeological site by Roberto Gagnon, one of our dedicated and entertaining docents. The weather was typical for October, sunny and dry, and a little too warm by the time activities were starting to wind down. Stabilization work was conducted on top of the mound and along its western wall, as well as in a few of the compound rooms. The ruins stabilization process involves several steps. First, the loose, crumbling portions of adobe wall are carefully removed with a brush to expose a hard surface. Next, a whisk broom is dipped into a bucket of water and thrust close to the wall in sweeping motions in order to moisten the wall. When the wall is sufficiently damp and free of crumbling material, amended mud is “slung” by hand onto the wall. The amended mud is then smoothed, also by hand, to fill in wall cracks. Lastly, a brush is used to stipple the newly applied material, in order to remove any finger prints and create a more consistent appearance to the wall. Whereas it is important to be able to identify newly applied amended mud from original fabric, it is also important that this distinction not be too obvious. This subtle distinction is a fine art that takes a great deal of experience as well as patience. Following stabilization activities, the ground surface is gently raked to remove footprints and debris. Jim’s excellent leadership was a great benefit to those who are new to ruins stabilization and also for those who haven’t performed this work in many years. His careful attention to detail and general enthusiasm for the work contributed to a productive, yet also fun experience for many of us. Of concern, however, is who will lead the PGM Mudslingers when Jim finally retires? His skill and dedication will be difficult to match. For anyone who may be interested, please speak with Jim at the next Mudslinging event on November 19 (8 am to noon). In addition to Jim and the dedicated team of PGM Mudslingers, special thanks and recognition go to the following individuals: Tom and Mira from AIA (President and Vice President of Central Arizona Society), for their assistance with the event and their team of volunteers; Mike Zajac, for helping to recruit and organize; Roberto, for providing thought-provoking tours; Kathy Neenan (SWAT) for doing great work while also taking awesome photographs throughout the event; and to Dave Morris for opening the museum early and providing logistical assistance. This looks like a blast! I would love to volunteer for that. Always wanted to be an archaeologist, even if it's only for a day. Great photos, by the way. Hard to take good photos in the sun like that. Kudos to your photography people. Thanks for the comment! The Mudslingers are always looking for new volunteers to help out. If you are interested in volunteering, contact the project coordinator Jim Britton at jabritton@cox.net to find out more! Pueblo Grande Museum is an archaeological site museum and repository. We collect, preserve, research, interpret, and exhibit cultural materials from the site of Pueblo Grande and the Greater Southwest. The Museum, part of the City of Phoenix Parks and Recreation Department since 1929, is dedicated to enhancing the knowledge of prehistory, history, and ethnology of inhabitants of the Southwest, and promoting a greater understanding of the diversity of cultures past and present, for our guests and the citizens of Phoenix.